Trending boxes can be seen is social networks. Facebook, Twitter, Google + have it. Why not create one of your own. You can create your own using HTML and add styling by CSS. We will use PHP for updating most searched queries in MySQL database. 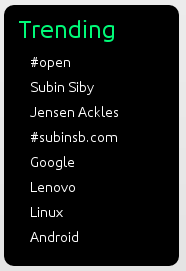 When a user searches for a query in your search page, it should be automatically added to the "trends" table. To automatically add the queries, append the following code at the end or beginning of your search page. The $q variable should contain the search query. When a user searches for a query, the script updates the value "hits" to +1 ("hits" + 1). If it wasn’t successfully updated, the query is inserted in to the table with "hist" as "1". The "hits" field determines the popularity of the query. The query with the most "hits" value is the most trending query. To display the trending box, we get the first 10 popular queries (highest "hits" value) from the table. Then it is displayed in the descending order of the "hits". Yes, the "x" should be in the query or you would get the derived table error (#1248).